four tiny drum machines from ALH84001 on Vimeo. Cybernetics is poised to make a comeback. The theory is, everything from electronic circuits to plants and animals can be understood in terms of feedback loops, as organisms – mechanical or organic – respond to input from their surroundings. The father of modern cybernetics, MIT mathematician Norbert Weiner, was inspired by working on the guidance systems of missiles. His writing was picked up Louis and Bebe Barron, informing their organism-like sonic circuits, as used in the film Forbidden Planet. The word cybernetic itself comes from Plato. Plato was talking about human self-governance. But designed with cybernetic ideas in mind, technology, too, becomes self-governing and autonomous – and the sonic circuits, too. Young designers like Eric Archer are to me the newest continuation of work like the Barrons’. Inside his lab, Eric and others are creating hardware that behaves like intelligent life. In the video at top, four tiny drum machines, equipped with insect-like brains and reflexes, network together wirelessly over infrared, responding to light by way of photocells. These tiny devices form a colonial consciousness. Eric may be a mad scientist, but he isn’t keeping his work secret or proprietary. He’s sharing the tools, sharing his methods, and with a whole growing crew of sonic DIYers in Austin, Texas, inviting anyone to join the revolution under the banner of the Handmade Music series. (More on the upcoming event shortly.) If you’re not from Texas, a lot of this documentation is also appearing online. 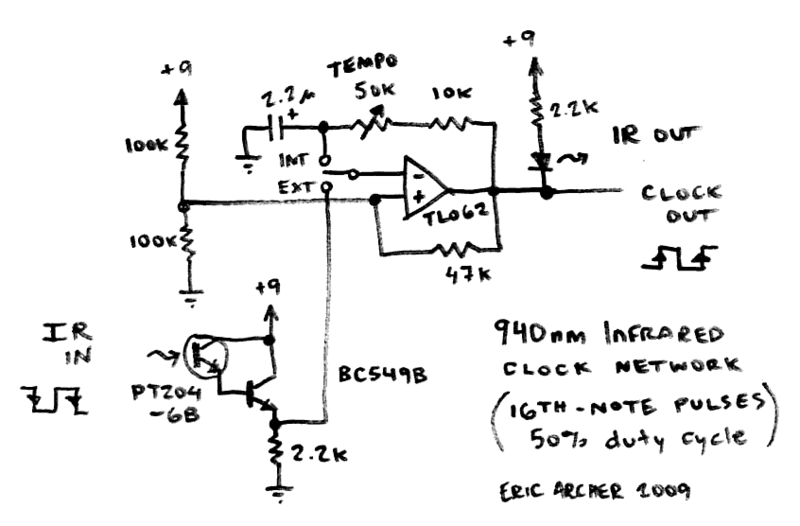 Here are more of the creations, plus the simple but powerful circuit that makes it all happen. And yes, there’s a lot of potential to wireless IR sync. The Autonomous Bassline Generator creates deterministic bassline patterns in a sci-fi retro sound by generating melodies on the fly, based on a knob. 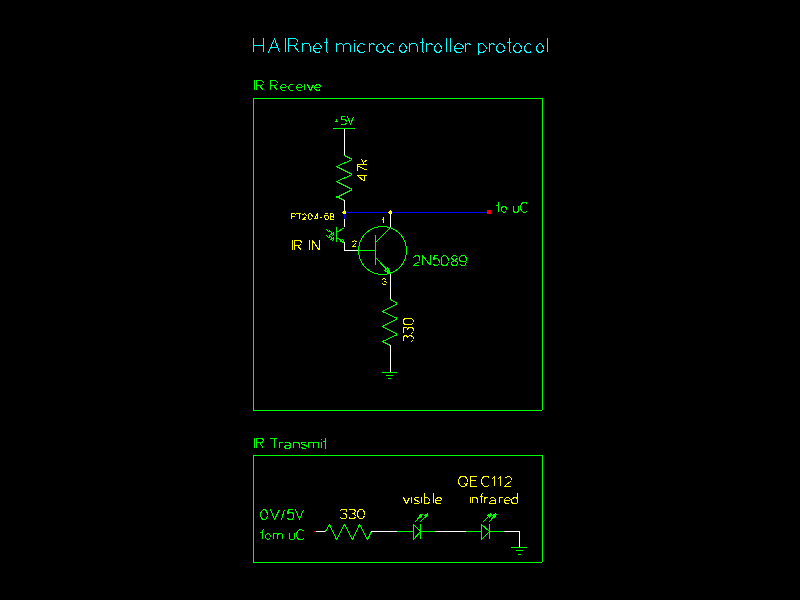 It’s just an AVR (attiny44) chip doing all the work, plus an opamp to act as the filter (photocell). The blue button is Tap Tempo, or if you hold it down for 1 second, it syncs up to the pulses on the IR receiver (this lets you beat-sync multiple Andromeda Space Rocker modules). The red button lets you edit a single note in the melody. Pulse-width modulation is currently pre-set to a certain envelope, but that will become user-controllable soon! Part of the “Andromeda Space Rockers” series of modules, see www.ericarcher.net for drum modules. The 6-pin header board dangling to the right is an ISP header. Totally hackable! Yes. Yes, you can. There’s already a MIDI-to-IR prototype in the works. Four analog drum machines are synchronized with a desktop computer running Logic. Logic is playing a loop with TR808 samples. MIDI timecode from Logic is converted to IR Sync with a PIC microcontroller. The PIC flashes an infrared LED, providing wireless clock to a chain of analog drum modules. Each drum module has an onboard sequencer, analog sound generator, and IR Sync repeater. At the end of the video, the tempo is increased to almost 3000 BPM. In a separate test, the system played OK at 1000 BPM. Of course this tempo is ridiculous but it is a nice “torture test” of Nathan’s PIC code. Our friends at Bleep Labs also have projects in the works. Eric and 4ms have contributed the circuits at the heart of this. 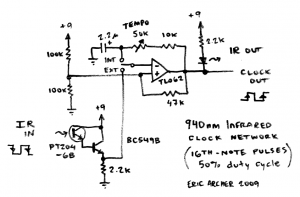 This simple circuit handles infrared clock networking. (Click for the full circuit.) I’m assuming you know how to read this; we may have to put together an actual how-to tutorial for those new to electronics, too. 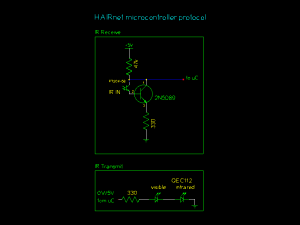 And 4ms has a version for interfacing with microcontrollers. The Barrons would be proud. For more on the Handmade Music series as it spreads around the planet, visit http://handmademusic.createdigitalmusic.com.